Home / Stock Picks / Hot Stocks / The Market Is Strong, Even With Rising Risks — What to Buy Now? Stocks are up over 16% so far this year, as tracked by the S&P 500 Index. That’s astonishing given that last year, from the start to the top on Sept. 20, 2018, the S&P 500 Index was up only 9.62%. So, what’s driving all of the buying? I’ll start with FOMO. Fear of missing out is a powerful motivator in the markets — the idea that if you don’t get in and buy, you’ll miss out on the big rally. I believe that’s a big part of getting more investors, from hedge funds to individuals, to reduce their money market funds or buying power in their brokerage accounts and shift to stocks. And as the market builds on gains and the financial and Main Street media reports more and more on the upward progress, it only fuels the buying. And this isn’t a new thing. Take any of the past big up market moves of the past decades and you’ll see FOMO kick in and remain until fear takes over after some big down days. We saw examples of that at the start of February and October of last year. Next is the Federal Reserve and its Open Market Committee (FOMC). The FOMC bungled its messaging last year. It laid out the plan to watch core inflation as measured by the Personal Consumption Expenditure Index (PCE) and said it wanted to see the PCE reach 2% and then some before it would need to act. Then it acted anyway, reducing the bond portfolio and stoking fears of more aggressive actions alongside raising its target range for Fed Funds. Then, with the stock market slipping and politics coming in on the play, it punted, and now it’s pretty clear that it’s going to be passive for a while. This means that the bond market will continue to be supported with the FOMC keeping its bond portfolio more or less intact. And with easy money with interest rates still not far from post-crisis levels, the credit market supports a buoyant stock market. Moving it forward is the concept of Modern Monetary Theory or MMT. This is a spin on an old theory attributed to many, including German economist George Knapp. And in very brief summary, MMT holds that the government that issues fiat money can do so largely at will and can control inflation via taxes or bond issuance. This way, government can spend at nearly at will. Of course, this works until it doesn’t, when money isn’t recognized, and no one will buy government bonds except the central bank. But it is being rolled out as a politically pleasing means of not only keeping the FOMC’s bond portfolio, but potentially for having even larger government budgetary spending for all sorts of things. Next up is the bond market. The U.S. 10-year Treasury is sitting near 2.59% and remains well bought in the market. This, in turn, is aiding the market for mortgages, which lenders and traders use as benchmarks for modeling prices and yields. So, mortgage rates should remain low, providing further economic stimulus as well as consumer confidence all good for stocks. And it isn’t just because of the FOMC. Demand by bond buyers, from wealthy investors to insurance companies and pension funds, remains strong. And given the demographics of the U.S. market aging further, that demand should keep a lid on yields for a while. And in turn, with lower Treasury yields, the corporate and other bonds, including municipal bonds, look even more attractive for the same bond investors — all helping the economy and the general stock market. And last up is the U.S. dollar. The dollar, as measured by the Bloomberg US dollar Index, which tracks a basket of 10 major currencies, is up nearly 7% over the past year. That makes the U.S. a prime destination for global investment. This shows up in U.S. Treasury tracking of foreign government and private inflows of capital that are buying U.S. stocks and bonds. And while there were some outflows in the downturn in the fourth quarter for U.S. stocks, overall, the net amount of foreign investment in the U.S. is vastly higher in the most recent data than were it was back in 2016. And all of this comes as the underlying themes that I’ve been writing about recently about consumer comfort and business confidence to invest in long-term capital spending remain intact. Now, where will the cracks show up? I think that the biggest risk for the U.S. stock market is the reality of company performance. One of the reasons for the selloff in the fourth quarter last year was the fear that sales growth and, more importantly, earnings growth would slow from the stellar numbers of last year into 2019. For the fourth calendar quarter of 2018, the members of the S&P 500 Index reported sales growth, on average, about 6% and earnings growth around 12%. But what may be coming for the coming quarters looks a lot slower. And so far, as earnings for the first calendar quarter are rolling in, it has been a mixed bag with more risks on the horizon in the coming weeks. Tech Stocks — Stocks to Buy, or Topping Out? This is particularly threatening for the information technology sector. 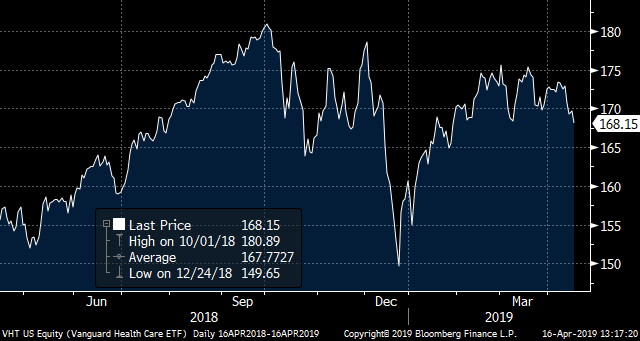 This segment of the S&P 500 Index has been a big driver of the performance of the index this year, and is one of the more highly valued. Any disappointments in the earnings from the first calendar quarter of this year will most likely have a negative impact on the overall index — and the market. So, while many companies turned in some nice numbers from the fourth quarter, the risk is that as more folks take a look at the expectations for slowed growth in sales and earnings, the compelling case to buy fades and selling comes back. And at the core of the risk sector would be the information technology stocks, particularly found in exchange-traded funds (ETFs) such as Vanguard’s Information Technology ETF (NYSEARCA:VGT). This ETF has soared, with a price gain alone from Dec. 24, 2018 to date of over 35%. It is the underlying, synthetically represented stocks that have the greatest risk for earnings disappointment. This is why I continue to recommend plenty of safer, more income-focused investments and defensive investments in the model portfolios of my Profitable Investing. But that said, I do believe that even in some downturns for the general market that there are plenty of stocks in industries that worked in tougher times and will work going forward. But above all else — keep your focus on the dividend and income paying investments right now. In particular, look at a few key segments stating with real estate investment trusts (REITs). REITs have been one of the stellar performing sectors but still remains a value. 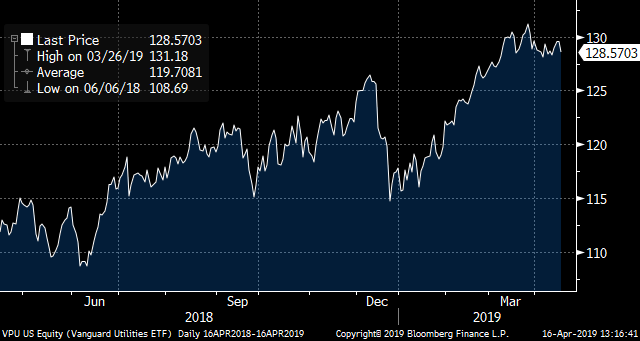 The Bloomberg US REITs Index has generated a trailing year’s return of 19% and was one of the better-performing indexes, losing less during the broad U.S. stock selloff in the fourth quarter of 2018 than many peers. 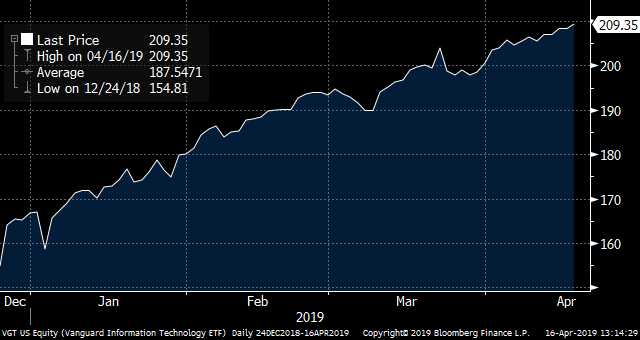 One of the easiest means for synthetic exposure is in the Vanguard Real Estate ETF (NYSEARCA:VNQ). Next is the utilities market sector. Again, like with REITs, utilities provide defense with better yield and the added benefit of having both regulated and unregulated businesses. 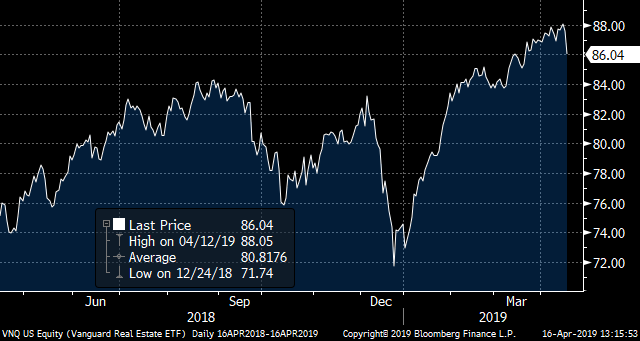 The S&P 500 Utilities Index has a trailing year’s return of 19% and was again a better performer during the selloff late last year. The go-to ETF for exposure can be found in the Vanguard Utilities ETF (NYSEARCA:VPU). And last up is the healthcare sector. With U.S. healthcare spending solidly on the rise — regrettably due to an ever-aging and more unhealthy population — this makes for a defensive sector with growth still in the works. The ETF for broad synthetic exposure is the Vanguard Health ETF (NYSEARCA:VHT). The key to dealing with a toppy-looking market is to be aware of what got it there, the threats that are rising and where to begin to diversify ahead of the next pull-back or sell-off. Neil George is the editor of Profitable Investing and does not have any holdings in the securities mentioned above. Article printed from InvestorPlace Media, https://investorplace.com/2019/04/the-market-is-strong-even-with-rising-risks-what-to-buy-now/.